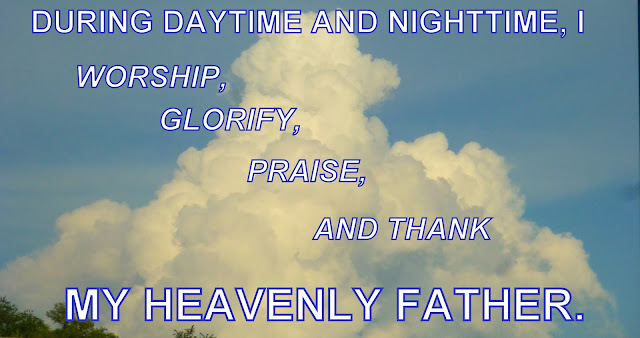 Well, I'm going to show you a picture that I had put on at another time, maybe about a year ago re: worshiping and glorifying and praising our Heavenly Father. I have been worshiping and praying often while driving around from our Omaha area and around parts of our nation. I'm very sad, b/c I can't drive. At a hospital in December 12, '15, it was officially dropped onto my that I can't drive. Mostly, b/c of the dementia and/or my body issues. Well, I'm still very sorrowful, b/c I can't drive. My husband and a couple friends drive me around, usually on "my" car, to the locational areas here where I can worship and pray and glorify to the Lord. Anyhow, in our house, many times a day and at night, I do my singing to the Lord. I'm usually walking for about 1/2 hour and then back home and sitting and resting. When I'm able to walk here from our home with my 2 canes, I focus on the Lord and worship and pray. I often consider how glorifying it will be in Heaven for all of us. When I'm seeing clouds, I always smile!!! So, that's my main way to focus on the Lord. Anyhow, here's the photo again, and it's exactly what I can do. He is all that counts!!! WORSHIPING THE LORD! ALL I CAN DO!!!! All I can do is share a small piece. The Lord uses me to pray and worship and glorify and praise in our home and around the local area and when on a car to go anywhere. I am very tired and can't do much, but I can walk and worship. Anyhow, my dementia has increased and my situations re: my feet and ankles cause me to stumble. I use my two canes anytime I'm walking out and I'm truly hearing from the Lord exactly where to go on the streets and watching the homes. About 20 years ago, the Lord dropped this onto me. The reason He has shown me where to go, usually from here to the a variety around our nation, because, spiritually, I have been shown re: the issues here up to thousands of years. During those times other gods were strong and people and animals, etc., were sacrificed to and for the gods. The Lord has used me... and others... much of the time re: worshiping and glorifying the Lord and praying for the locations. I was a driver around our nation for more than 35 years. NOW, since a hospital on Dec. 12, '15, indicated I can't drive any more... a brain thing ... it's a heart-broken issue for me. In these months, my husband and a couple friends have driven me around and most of those locations even when I had been driving around and used to worship and pray. I did it nearly ever day then. Well, now I have it a couple times a week, wherever I choose, and, when sitting in the car, I'm still worshiping and praying and glorifying time. That's all that counts. And the pictures are connected to the walking and the driving. I'll share the clouds. I'm a cloud addict!!! I can hardly get on the blog stuff any more, but I love and miss so many of you. I'll be going to bed soon, and it's usually 11 to 12 hours in bed. The normal situation now is that, when I'm in bed, I'm singing and worshiping until I am asleep at night and then begin as soon as I wake up at night a few times and then when waking up in the morning. All I can do and, again, focusing on the Lord is all that counts.